Generous natural resources and the traditionally agrarian population constitute important advantages for the Romanian livestock sector. Romania's integration in the EU led to the emergence of a lot of opportunities and restrictions for the national food producers. The national food safety assurance system implies the best use of the natural potential, under the conditions of the food production sustainability. 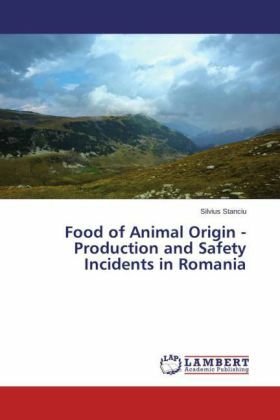 "Food of Animal Origin - Production and Safety Incidents in Romania" carries out an analysis of the Romanian animal origin food production, which is most exposed to food safety risks. The author analyzed the local agricultural sector, zootechnics, foreign investment in the livestock sector and the food critical safety incidents. Important parts of the book were destined to the milk sector, meat production and food industry analysis. The horse meat scandal,in which Romanian producers were involved, constituted part of the book.The book ends with a sectoral analysis on food processing in Romania and special references regarding meat processing sector. Although progress has been made, Romania still has deficiencies in optimizing the agro -food yield and the food safety system. Platz 3: Harry Potter Boxed Set: The Complete Collection, 7 Vols.